BC volleyball has been a top team in the NWAC for several years under the direction of Coach Jocelyn Lawrence. In 2018, the Bulldogs finished third in the NWAC North Region with an 8-4 mark, finishing 24-15 overall. Sophomore Carlee Rowell was named first-team North Region and sophomore Jordan Hunter was a second-team selection. In 2017, The Bulldogs finished first in the NWAC North Region for the second consecutive season and then completed an astonishing comeback run to finish second at the NWAC Championship Tournament, compiling a 38-14 overall record. 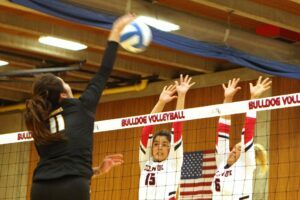 In the tournament, the Bulldogs dropped their second match and then won five consecutive matches, including four straight on Saturday to earn a berth in the championship match. In the final, BC was up 2-1 before dropping the final two sets to top-ranked Chemeketa, which had not lost a match since Sept. 15. Sophomore outside hitter Averi Dyer was named North Region MVP, and freshman Carlee Rowell and sophomore Erika Weber were name to the all-region first team. Freshman Megan Rogers was named to the second team. Lawrence was named North Region Coach of the year for the second consecutive season. In 2016, the Bulldogs finished first in the NWAC North Region and placed seventh at the NWAC Championship tournament, compiling a 36-10 record on the season. Bellevue shared the North Region title in both 2012 and 2013 and finished second in 2011, 2014 and 2015. BC, 5th, Walla Walla Inv. BC, 7th, Walla Walla Inv.